Check MSI 2.00.0023 free download. Check MSI is a tool for setup programs that checks the version of the Microsoft Windows Installer present on a user's system. Catfood Fortune Cookies is based on the popular UNIX program Fortune. Catfood CamSaver displays live video from any camera connected to your PC as a screensaver. Do You Want To Install Or Upgrade Micosoft Windows Operating System On Your Computer With Setup Files? 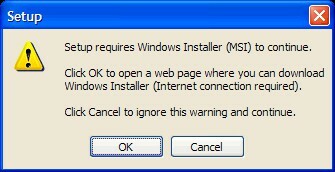 Then UWin Installer (UWI) is what you NEED! UWI Is A Tool For Quick & Easy AUTOMATED Install Or Upgrade Of Microsoft Windows O.
HKSetup gives you a template project to create self-extracting zip files. Setup2Go is an utility for designing full-featured, 32-bit Windows Software Setup programns fast!Setup2Go supports all 32-bit Windows versions in use today - Windows 95, 98, ME, NT4, 2, XP.